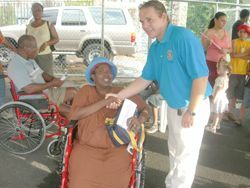 It was an emotional day last Saturday evening when the Rotary Club of St Vincent presented the first of 280 wheelchairs to needy Vincentians. Among the recipients last Saturday evening was 59-year-old Jacquline Boyde of Campden Park who cried tears of joy. “I just want to say thanks to the Rotary Club for making my life much easier, I am grateful for that,” she said. She lives alone and depends on the Home-Helpers for assistance. While she will now be able to move around her home with ease, trying to navigate through Kingstown is a major task, she said. None of the public transport can accommodate wheelchair users and few, if any buildings at all, have ramps. “I think that the government needs to do something about the situation,” she said. Minister of Culture RenÃ© Baptiste applauded the Rotary Club for acquiring and distributing the chairs. She said government was very pleased to be part of the project through the Medical Association and by providing the necessary concessions for the importation of the wheelchairs. Dr Francois Truchot, Director of the International Committee of the Rotary Club, said that each recipient will receive a certificate of ownership. The Wheelchair Foundation is a non-profit organization with a mission to lead an international effort to create awareness of the needs and abilities of people with physical disabilities, to promote the joy of giving, create global friendship, and to deliver a wheelchair to every child, teen and adult in the world who needs one, but cannot afford one.